LOCATED JUST 5 KM SOUTHEAST OF XINCHANG CITY, QIONGHAI LAKE IS THE SECOND LARGEST LAKE IN SICHUAN AND ONEOF THE MOST POPULAR TOURIST ATTRACTIONS IN THE PREFECTURE. 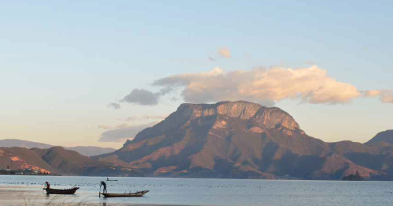 The lake is embraced in the peaceful arms of lush green Lushan Mountain in the south and the majestic Daliangshan Mountain in the east, making it naturally rich and spectacular. The beautiful sceneries also earned the lake the reputation of one of the greatest scenes in Xichang. As season changes, Qionghai Lake reveals its different faces to the world. There are many faces to the magical sceneries of Qionghai Lake don’t varied with the season. In spring, the lake and its surroundings are kissed by lively willow trees and pink peach flowers, then comes the summer when reflections of distant mountains, trees, temples, and villages all combined to create stunning panoramas. Autumn arrives and the leaves say goodbye to the trees, creating a rather lonely yet romantic scenery around the lake. The circle ends with the winter breeze blowing softly as red maples stand by the side of monasteries and pavilions, revealing another kind of beauty against the background of the lake. February 21, 2018 admin Comments Off on Discover the Wonders of Magical Myanmar with Best Western.